After a week of heavy snow, I knew that my three and four year olds would love the opportunity to make snowy pictures. But instead of the ubiquitous snowman project, I wanted to try something a bit different. 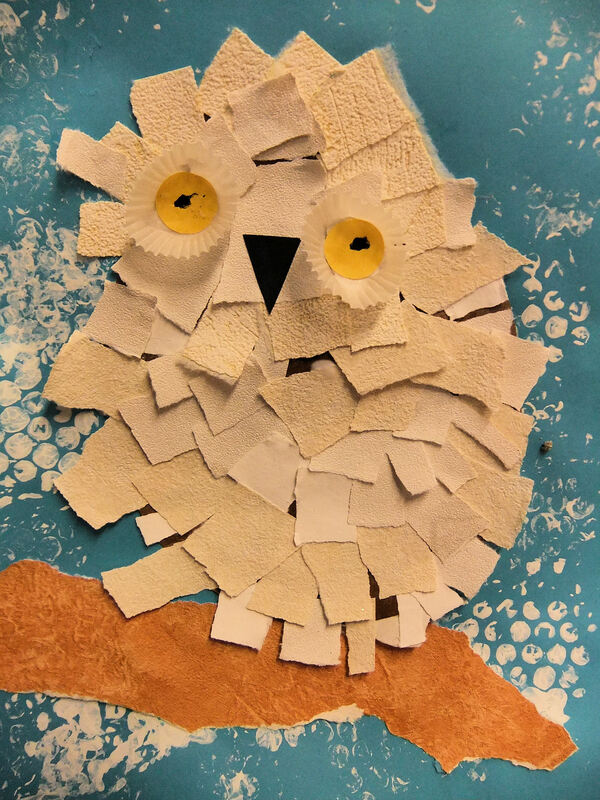 Snowy owls are far more interesting than snowmen, and also provided the perfect subject matter for a collage project making use of a huge stack of textured wallpaper samples donated recently by an Art Club parent. However, the first stage of this project was to paint a snowy background on light blue paper. 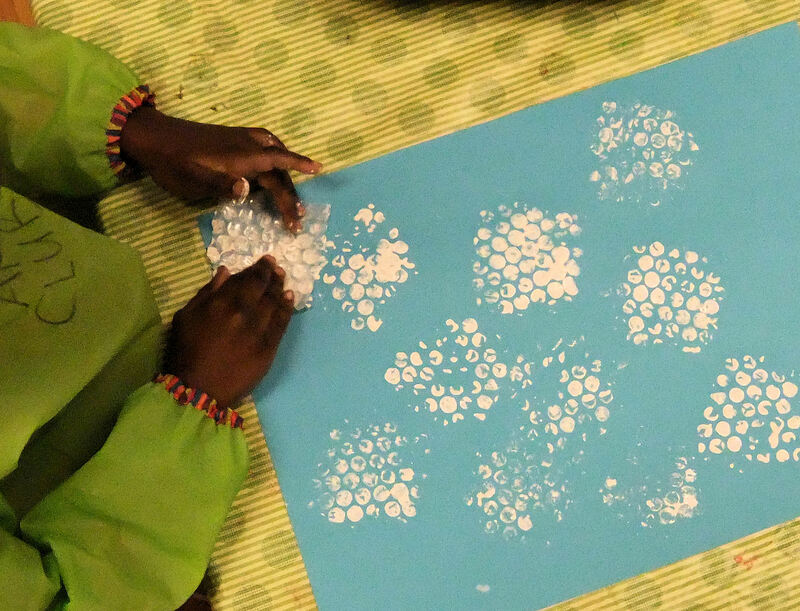 Using small pieces of plastic bubble-wrap and white paint, the children printed patterns of small white dots across the paper surface. While the paint dried, the children made their owls. A circle of brown paper was glued onto an oval shape of the same colour, to create the owl’s head and body. Then I gave each child several strips of the textured wallpaper, and showed them how to tear them into small pieces. The action of tearing paper is actually quite difficult for young children, but all of the children had a go and soon had a selection of paper scraps to cover their owls. 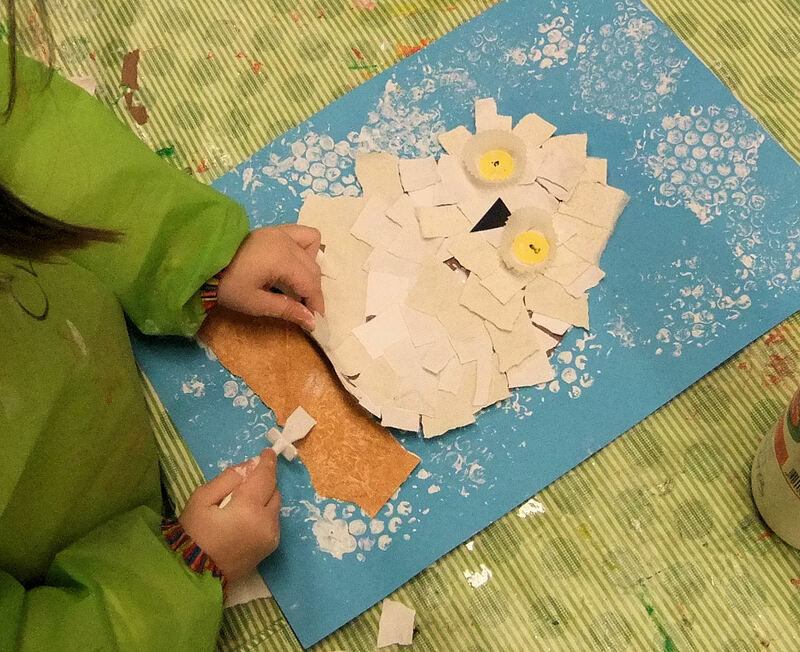 I encouraged the children to glue the torn paper pieces so that they overlapped the paper edges, in order to give the owl a soft, feathery appearance. Once they had added feathers all over their owls, the kids created eyes by gluing circles of yellow paper inside two small muffin cases, and drawing two black circles in the centre of each. A black triangle was added for the beak. The final element was a roughly-torn strip of brown wallpaper, creating a tree branch for their snowy owl to perch upon. I love these snowy owls! The textured wallpapers create a wonderful, multi-layered, feathered effect, and the bubble-wrap printed snow adds a further dimension to the collage. 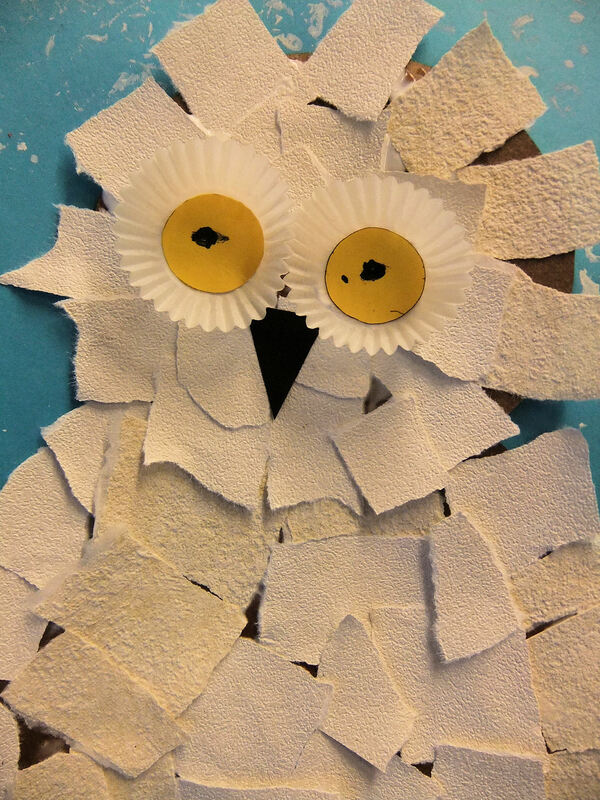 Please click through the Gallery below to view more Snowy Owl collages. For another version of this project please click here to view a more recent blog post: Snowy Owls: Textured Wallpaper Collage (February 2015).